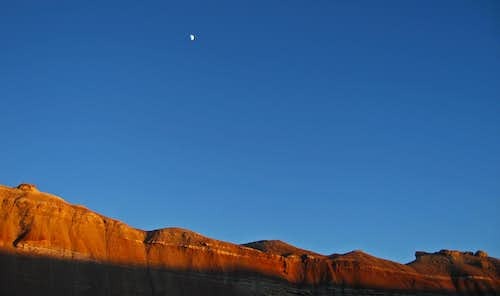 Ramp and Cistern are two remote canyons at the southern end of the San Rafael Swell. Ramp canyon has some very nice narrows and a large chalkstone that poses a problem for beginners. A 5.4 climbing move with moderate exposure is required to pass through Ramp Canyon. 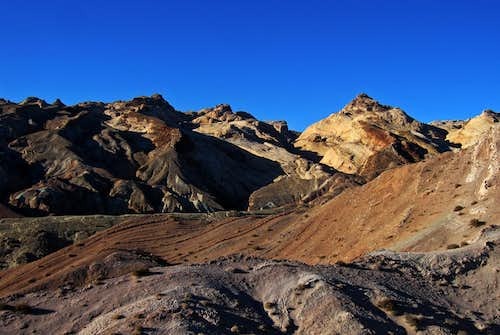 Cistern canyon is a simple walk through and isn't too spectacular but provides different scenery and a good second half of a great loop hike. 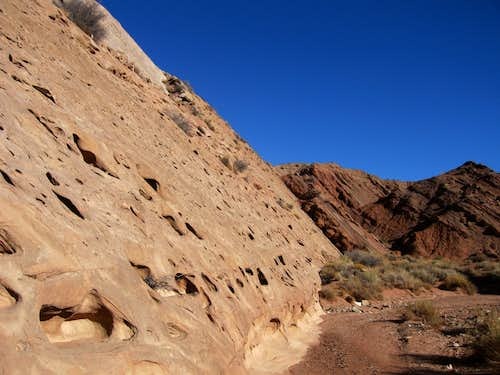 It is recommended that one travels up Ramp canyon and down Cistern Canyon due to the climbing needed in Ramp Canyon that would be much easier going up. 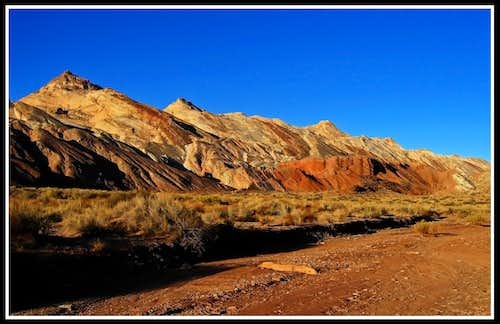 This loop incorporates Ramp and Cistern Canyons and takes you on the Wild Horse Road all the way until it gets to the Muddy River crossing past the trailheads for Little Wild Horse Canyon and Ding/Dang Canyons. This road starts heading east off of the Goblin Valley Road just before the entrance station and visitor center. 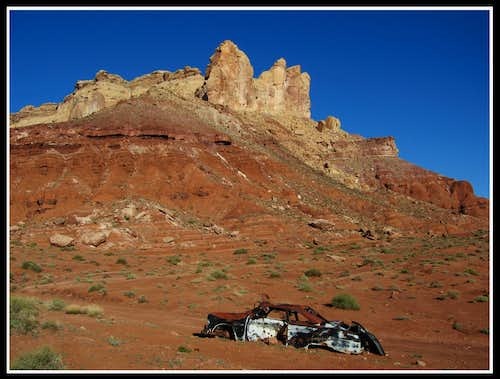 A high clearance vehicle is needed to continue on the Wild Horse Road past the trailhead for Ding and Dang Canyons. The road weaves through bentonite hills and passes by an old homestead before getting to the Muddy River. This river flows year-round and caution should be taken if one wishes to ford the river. For Ramp and Cistern park at the river and start hiking upstream in a westward direction on the north side of the river whacking your way through the grasses and bushes. 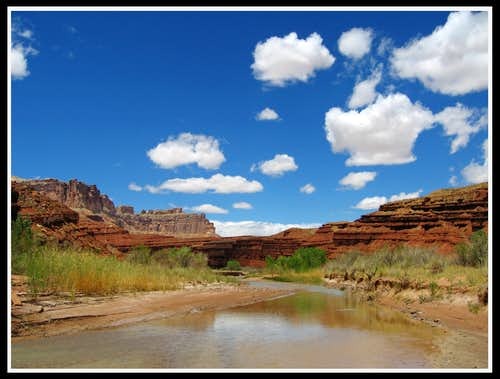 After a short distance you will notice the river pinches out at a cliff and you will have to wade through the river twice to get by. When I did this loop it was over Thanksgiving in 2009 and the water was very cold. Continue upstream by heading due west. Avoid all the switchbacks the river makes and head more in a straight line to shorten the mileage. After about 1.5 miles you will notice another large stream (may be dry in summer and fall) draining into the Muddy River from the south. This is Salt Wash and is the topic for another page. 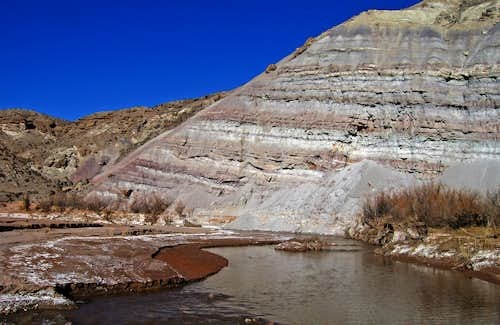 At this stream junction you will also notice you enter a very large valley between the San Rafael Reef directly ahead and a series of Entrada and bentonite hills and cliffs to your right. It's here that you will turn right and follow the valley in a northeastward direction. A small stream bed makes for a nice route as you walk up this beautiful valley. After another 1.5 miles along the valley you will come across a green patch of grasses to your left. This is the mouth of Quandary Canyon. 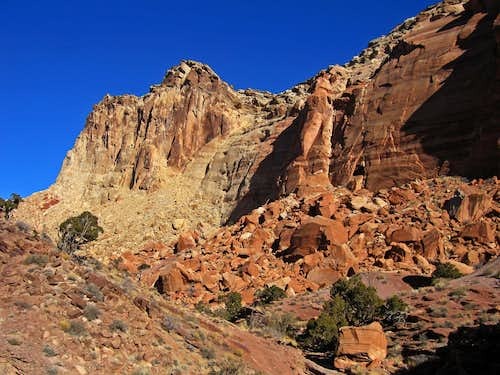 A number of side trips can be done if you head up this drainage but the canyon itself is very difficult and requires technical gear and can only be descended. However one could work their way up this drainage and start heading steeply up the right rim of Quandary Canyon and get high for some nice views as I did. There is a very nice camp spot in the middle of this grassy area next to a small cottonwood tree. This is where we camped. Continue past the mouth of Quandary for another 2 miles. 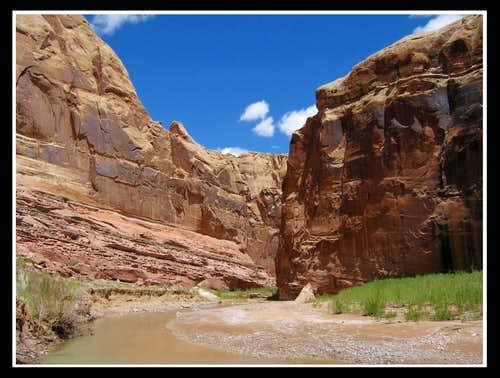 You will be forced to follow the stream bed since there are many Entrada cliffs and hills in the way to go in a straight line. After 2 more miles you will notice a large drainage coming in from the left. This is the drainage for Ramp canyon so turn left here and weave your way up canyon. Look for this ramp at the beginning of the canyon. The canyon begins to turn into some nice Navajo narrows. 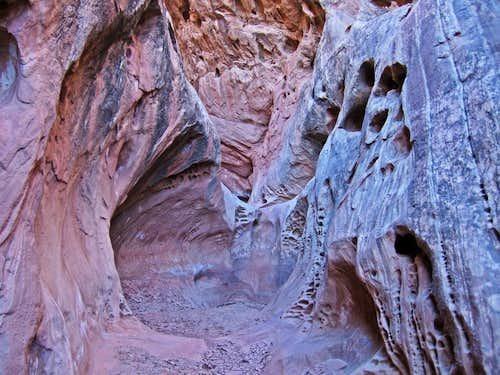 A dryfall will have to be avoided on the left by climbing up onto the reef itself and descending back into the canyon. Some cairns mark this path. After passing through the narrows the large chalkstone comes into view. One could climb up on the ledge on the right side or climb up the slopes on the left side. Either one requires a class 5.4 climbing move with about 25 feet of exposure. If you are backpacking you will need a rope and will have to pull your packs up in pieces (unpack your packs). Once above the chalkstone, finish the short walk up the rest of the canyon until you get to an old sign and road. 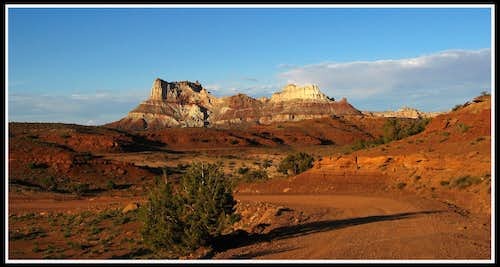 Head right (east) on this road and follow it uphill as it parallels the San Rafael reef from the backside. Crest the hill and head back down until you see the next major canyon in the reef. This is Cistern Canyon and will come after 2 miles on the road on the right. Start heading down this canyon and pass a small spring known as Blueberry Spring. This canyon is fairly open but has high walls. 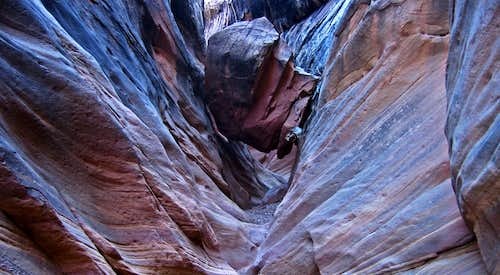 Near its end you will come across a large chalkstone wedged between the canyon walls and is easily walked under. See the primary page photo. 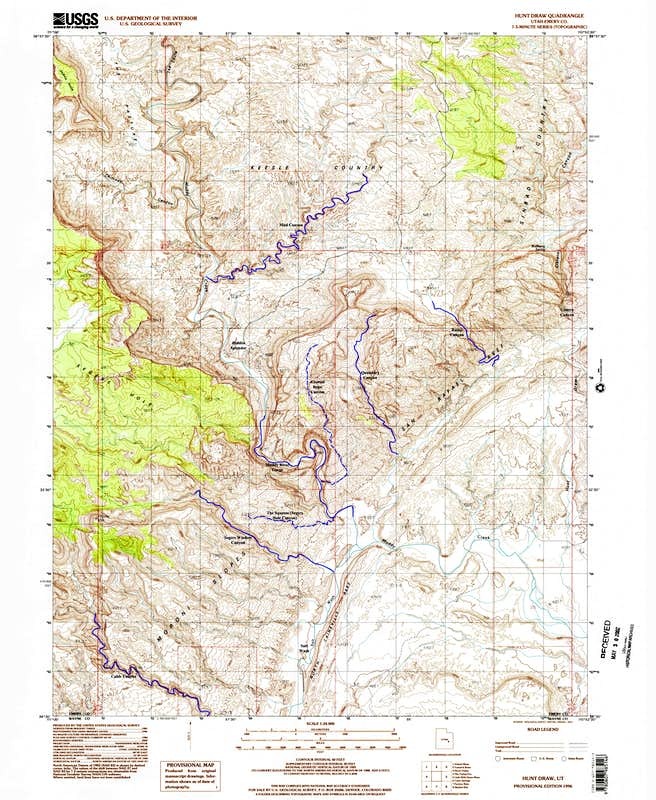 After exiting Cistern Canyon follow Hunts draw (the same drainage) south for 4 miles. This drainage has some nice aspects to it but is basically a long slog. There will be one dryfall to negotiate around. Head up and over on the left side. After 4 miles you will come to the road you drove in on (don't miss it!) Turn right and follow your cars' tracks for another 1.5 miles to your car at the Muddy River Crossing. There are of course many other ways to do these canyons but this was the route I chose due to the longer distance and exposure to more areas around the swell (I like longer distances). 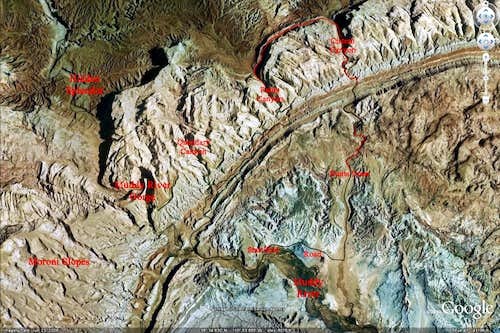 See the Google Earth image below for the route. To to Muddy River Gorge one should get to Hidden Splendor. Off I-70 take exit 129 and drive the good graded dirt roads towards Tan Seep. Continue south following the BLM signs for Hidden Splendor. All these roads are good for any car. From highway 24 take the Temple Mountain Road through the reef and on to Hidden Splendor. Here, the remnants of an old mine from the 1950's is around and an airstrip still used by private planes with permission from the BLM. The Muddy River gorge is in plain sight to the south. Park and follow the old road down to the Muddy River. The best way I found to hike through the gorge is by not wearing shoes but rather some sort of wading shoe or flip-flops. The water is a very nice way too cool off in the summer and is rarely deeper than knee deep. It takes awhile to get through the gorge as it's about 4 miles long. Once through you will come to the same beautiful valley noted in the previous section. One could return back up the gorge or use the route described in the previous section and head up the valley and ascend Ramp Canyon. Upon exiting Ramp Canyon you would want to turn left on the old road instead of right and follow it past the Quandary Canyon trailhead and the old Ford car back to Hidden Splendor (which is a long road walk). There are many other ways to explore this area. 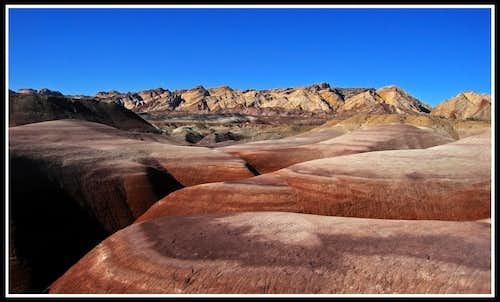 Depending on what you like better you can do one canyon at a time and park close to each one if you like shorter hikes. Or you could take my approach and do longer loop hikes. 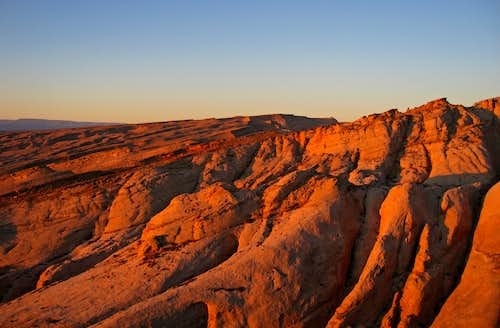 See Michael Kelsey's book "Hiking and Exploring Utah's San Rafael Swell" This is an amazing resource and has route and road maps for the entire area including detailed route descriptions for every canyon in the San Rafael Swell.